I’m there with you, even if i’m not physically there. Lovely shots. Happy to have you along, Kay. Karen – those first two shots, in particular, are just magical. And I love the way you combined “unexpectedly, expectantly” in the text: that was magical, too! I love winter for the magic it offers. Beautiful captures…. Fall and Winter are my favorite seasons. Thank you, yes, they are wonderful seasons, aren’t they. The shifts of nature are beautiful. I love is photos:) So wonderful colors, and some almost abstracts! Yes, abstract photographs can be fun to make. Thanks for your comments, Kerlund! Treasure abounds, precious in every season! As always, strikingly beautiful shots. Yes, treasure abounds. That’s a lovely way to put it. Love these photos! So fun to have wild birds trust you enough to land on your shoulder! Will look forward to more of your winter photos. I know, it always feels magical when the little birds perch on your hand or shoulder. They are so incredibly gentle. Karen there is a great deal of beauty and tenderness in those pictures, and the quiet fragility of the winter landscape really comes through, well done! Mike, thanks very much, the winter landscape is one I love. Everything does seem more quiet in the snow somehow. It’s like you dived to the bottom of the ocean and found a world even more beautiful than this one. And you brought seeds. Beautiful. Oh, you do have a way with words, Steven. Yes, I brought seeds, perhaps planted a few … I wonder what will happen next? Beautiful Karen. It seems mussels are in season. I’m seeing them here too. Hi Allen, thank you. The mussel shells are beautiful, aren’t they. Those luminescent colours caught my eye. Just beautiful! I LOVE IT!! These are gorgeous, Karen, especially the last shot. Thank you! It’s a little bit messy but I like it too. This is a beautiful post – not only the photos but your words added so much to the enjoyment. How lucky you are to have had birds land upon you so trustingly. Thanks, Patricia, much appreciated. Yes, the birds delight me every time. I love the images of the birds in flight. Your photos have so much quiet emotion. Thank you, Hannah. That’s a lovely observation. The last image is simply wonderful, thanks for sharing! Thank you, David. I’m glad you like these. I love them all but especially fond of the last one. Beautiful and so artistic!! Hi Laura, thanks very much! Beautiful, particularly the last one. Gorgeous! Calm and full of a quiet energy. Thank you, Micah. Winter seems to have a way of making everything a little bit quieter. 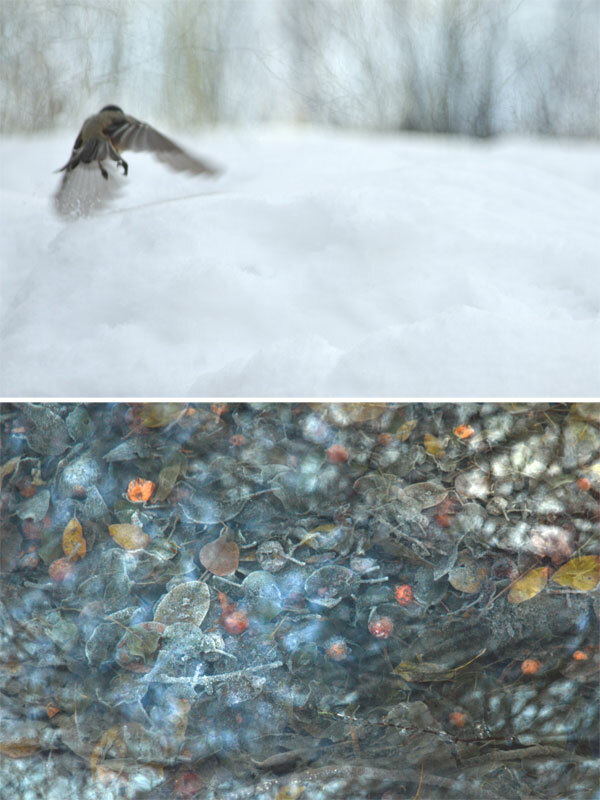 Karen, I’m totally falling in love with the middle ones (“A chickadee in flight and leaves in the creek”) – wow! Thanks, Anette. I like those together too. Karen… This is too long waiting for the next artwork! But it’s worth it waiting! Fabulous Karen! You redefine what is the meaning of photography. You inspire me! That’s very kind, Meho! Thanks so much, truly. “Anyway, if you are looking for gold and silver, it’s not far away. You just might have to dress warm.” — Thanks for the reminder; It’s so easy to just stay inside by the fire and miss it. Thank you, Mic. Yes, sometimes it’s hard to get motivated for the cold but it makes the fire all the more wonderful! I like your way to capture “may exists or may not exists”. Illusion like glare and reflections are beautiful. Lovely words, Helen. Thank you. Gold and Silver in any photographic award ceremony. Love the delicate poetry of your work. Thanks very much, Sean, you are too kind. Digging up treasures … You do it so well! Always looking! Thanks very much, Tobias. I really appreciate the way you comment the pictures you take. You don’t do it that often but every time it’s like opening a treasure, image and words together, thanks ! I am always blown away with your creativity, Karen. All are so enjoyable, but the starlings and reflections is special. Hi Steve, gosh, thanks for your comment. I do enjoy finding creative ways to work with photography as the seasons shift. Any excuse to get outside! I feel privileged to be allowed to peep in on your private space _ you communicate your feelings so well! Oh wow, thanks, Louis. I don’t think writing is one of my strengths so I appreciate that. Beautiful tender photos and lovely thoughts Karen! I agree gold and silver aren’t far away. And I like your idea of finding a way to photograph the magic of something. Thank you, Elina. It sometimes takes me a while to express what I want with a subject. I’m sure you know what I mean! Love the photos they are so beautiful! Hi Sophie, thanks for stopping by and leaving your kind thoughts. Nothing short of a mystical experience. Thank you. : ) Much thanks, Elena. I’m glad you think so. your light paintings are filled with natural mystery. gold and silver. showing the grace in nature, and what happens if we take a moment to be aware of the beauty around us . gold and silver. i can hear the rush of air around the bird’s wings. gold and silver. i can smell the richness of the jeweled water. gold and silver. i’m hooked! Thanks for the lovely poetic words! Yes, there is always something to notice if take the time. Chickadee in flight – !!! that picture really does capture a thousand beautiful words. Hi Carla, thanks very much. Wishing you wonderful holiday, too. Thank you, James! I love those little birds. I don’t know how you do it – all of it – just so carefully felt and expressed. Thank you. Oh, thank you, Lynn. That’s very kind. 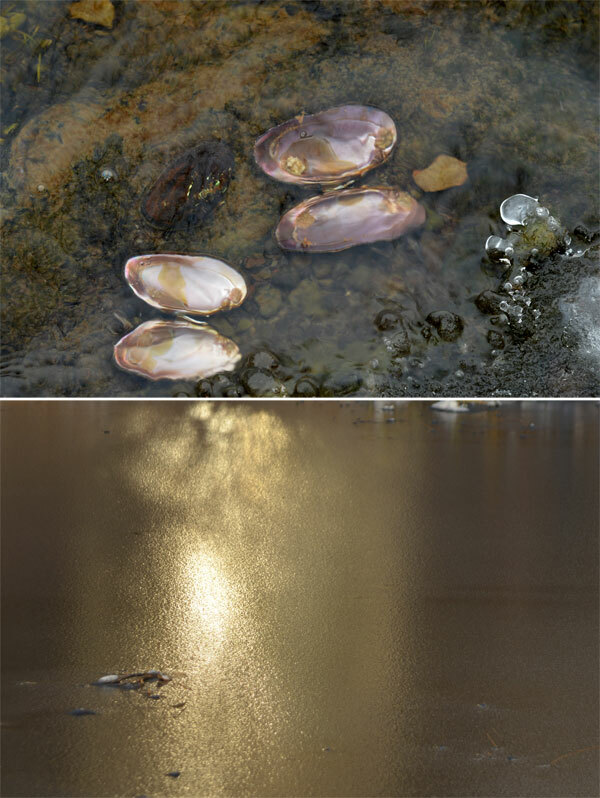 Touching series…in particular I am drawn to the reflection of the starlings. Thanks very much, I’m glad you enjoyed this series. I guess I didn’t explain that last photograph very well. 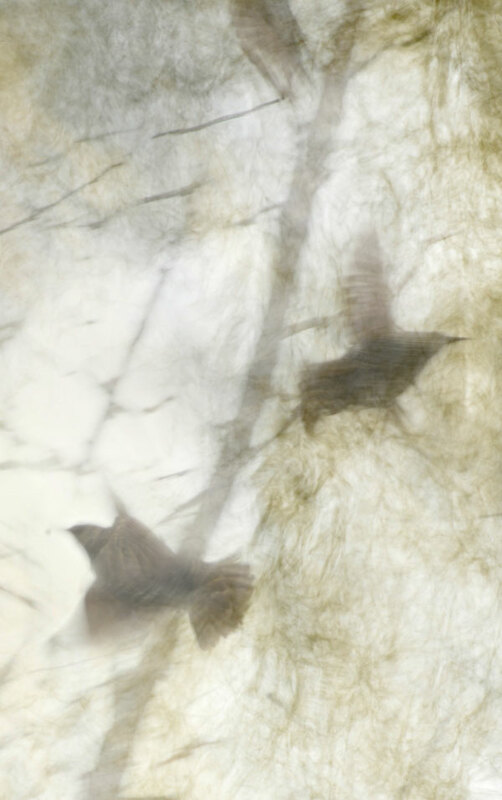 It is a photograph of starlings in flight layered with subtle water reflections – so two photographs merged; not actually reflections of the birds. So beautiful – nature’s riches on display. I particularly like the spectral starlings. I wonder if they are as ravenous in the nether world. Yes, lots of riches in nature. Thanks, Richard. So cinematic. Your photos are alive, never flat or static. You have a gift for capturing soul. Aw, thanks very much, Marcus. I was happy to see another little bird flew by your blog today! Magical photos, Karen. Great to get so close to the chickadees/nuthatch and so nice that you had seeds with you to feed them. These are just lovely Karen. I am going to have to come back and examine them all very closely, there is so much in each pic. The silver and gold pair are glorious, and I enjoy your words as much! Great idea – the pocketful of seeds! Oh I missed this in the reader – thank goodness for the Monday morning summary notice from Draw & Shoot. So so lovely – the golds, the silvers, the soft lilac colour, the spirit birds… delightful! I love love love the first two photos, especially together. I think that they both add to the feeling of the other. Beautifully executed, as usual. I enjoy the abstract quality of the birds reflected on the ice. Interesting images. Beautiful shots, Karen — I love the gold glitter and the beautiful leaves — your processing has such a delicate ethereal feel — gorgeous! The chickadee. You’ve got it going on. Beautiful post, Karen ! I love everything, your photos and your description. So delicate and poetic. Beautiful series, I just love the reflections of the birds. I became immersed in the moment with your words … so beautiful each and every one . Your work is extraordinary… and I just discovered it! fantastic movement in every shoot ! Since I’ve been in the city I haven’t been out in nature but know where I could “go” to escape if only for 5 minutes, so I’m here at your blog : ) What magical pictures these are. I so think they are all beautiful but the second one with its gold color is simply delicate and the bird in flight and the photo with all the colors is such a wonderful composition. It’s like listening to jazz…. 3,4,5 – the usual ecstasy. Hi Michael, thank you. Love your choice of words. Absolutely magical shots. Your website is beautiful!